A Child in Need is defined under the Children Act 1989 as a child who is unlikely to achieve or maintain a satisfactory level of health or development, or their health and development will be significantly impaired, without the provision of services; or a child who is disabled. In these cases, assessments by a social worker are carried out under Section 17 of the Children Act 1989. Children in Need may be assessed under Section 17 of the Children Act 1989, in relation to their Special Educational Needs, disabilities, or as a carer or because they have committed a crime. The process for assessment should also be used for children whose parents are in prison and for unaccompanied migrant children and child victims of modern slavery. When assessing Children in Need and providing services, specialist assessments may be required and, where possible, should be coordinated so that the child and family experience a coherent process and a single plan of action. Every assessment must be informed by the views of the child as well as the family, and a child’s wishes and feelings must be sought regarding the provision of services to be delivered. Consult with, and consider contributions from, all relevant agencies, including agencies covering previous addresses in the UK and abroad. NOTE: Where the parents have learning disabilities, it may be necessary to adapt communications to meet their needs – for further information, see Coventry and Warwickshire Safeguarding Children Board Procedures Manual, Children of Parents with Learning Difficulties. The interaction of these domains requires careful investigation during the Assessment. The aim is to reach a judgement about the nature and level of needs and/or risks that the child may be facing within their family and/or community. 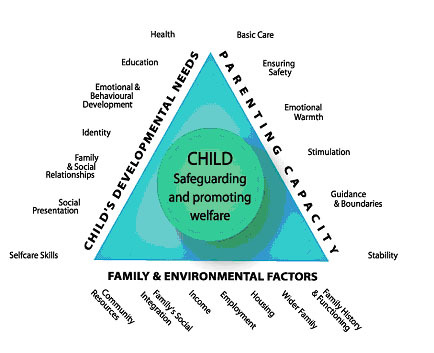 Importantly the assessment, in looking at the domains, should also consider where the strengths are in a child’s circumstances and in what way they may assist in reducing the risk. Note: if there is a concern with regards to trafficking, a referral into the National Referral Mechanism should be made See - GOV.UK Modern slavery victims: referral and assessment forms. The social worker should analyse all the information gathered from the enquiry stage of the assessment to decide the nature and level of the child's needs and the level of risk, if any, they may be facing. Social workers should have access to high quality supervision from a Practice Supervisor who will help challenge their assumptions as part of this process. Critical reflection through supervision should strengthen the analysis in each assessment. An informed decision should be taken on the nature of any action required and which services should be provided. Social workers, their managers and other professionals should be mindful of the requirement to understand the level of need and risk in a family from the child's perspective and ensure action or commission services which will have maximum positive impact on the child's life. Where there is a conflict of interest, decisions should be made in the child’s best interests, be rooted in child development, be age-appropriate, and be informed by evidence. All agencies and professionals involved with the child, and the family, have a responsibility to contribute to the assessment process. This might take the form of providing information in a timely manner and direct or joint work. Differences of opinion between professionals should be resolved speedily but where this is not possible, the local arrangements for resolving professional disagreements should be implemented (see Coventry and Warwickshire Safeguarding Children Board Procedures Manual, Escalation and Resolution of Professional Disagreements). Child protection chairs, chair the first child in need review where cases are stepped down from the child protection plan and that subsequent reviews are chaired by a team manager or senior practitioner. All new child in need reviews (other than those stepped down from a child protection plan) are chaired by a team manager or senior practitioner. All other child in need reviews are chaired by a senior practitioner or team manager. A useful comment from 'Working Together to Safeguard Children' reminds all professionals of the importance of reviewing progress and that a high quality assessment is one in which evidence is built and revised throughout the process and takes account of family history and the child’s experience of cumulative abuse. A social worker may arrive at a judgement early in the case but this may need to be revised as the case progresses and further information comes to light. It is a characteristic of skilled practice that social workers revisit their assumptions in the light of new evidence and take action to revise their decisions in the best interests of the individual child. Decision points and review points involving the child and family and relevant practitioners should be used to keep the assessment on track. This is to ensure that help is given in a timely and appropriate way and that the impact of this help is analysed and evaluated in terms of the improved outcomes and welfare of the child.